In a highly competitive industry that still seeks to stereotype and provides few leading roles for Asian actors, Brian C. Hirono is helping to pave the way for future Asians in Hollywood. One of Brian’s greatest assets is his eclectic background. Born in America, hailing from a mixed bloodline of Japanese and Korean, he has lived all over the world, feeling at ease with numerous cultures and languages. With an insatiable passion for acting and directing, Brian is an anomaly among Asian actors in Hollywood. Instead of fighting against typecasting of Asian males, he not only embraces roles many other Asian actors may shun but idealizes such roles that involve portraying a multidimensional antagonistic character. Brian’s years of in-depth studies and unique perspective allow him to bring profundity to characters that might otherwise be viewed as typical Asian bad guys. Indeed, this talented rising Hollywood star has taken an intelligent strategy of turning average characters into the extraordinary, thereby erasing any sense of typecasting. Recently, I had the chance to chat with Brian and ask him a few questions. Driving with my Dad to Ralph’s to get Butter Pecan ice cream. My mom was, and still is, a bit of a health nut. So my dad and I would sneak out and get ice cream. But I’d always get caught because I kept forgetting to wipe my mouth afterwards. Tell us about the mix of cultural heritages you grew up with between your Korean mother and Japanese father. Did they each instill their traditions in you? Yes absolutely. Both my parents made it a point that I retain their languages. My mom taught Korean to the kids at our church. And then when I was 13 I went to a self-sufficient, farming boarding school in Japan. Thanks to them, I’m fluent in both today. My first job when I got to New York, I played a motley of mythical characters for a children’s play in New York. On screen, Hawaii 5-0 is the first job I booked. Do you find that Hollywood still heavily typecasts Asian actors? I think we’ve made a lot of progress. But I think there are still “types” for Asians. But shows like, LOST and HAWAII 5-0 are changing how Hollywood portrays Asians/Asian-Americans. Our characters have become much fuller and more truthful. I would love to see this tide continue. Personally, I am optimistic that there are more great roles for me to play now than even 5 years ago. What are some of the difficulties you’ve encountered in your Hollywood path? There isn’t a plethora of Asian/Asian American roles yet. Hence, the market for Asian/Asian-American actors is much smaller too. Just waiting around can be quite emotionally exhausting. For me, I write and produce my own short stories on video. As an actor, the self-generated work is very empowering and also can be an avenue to get your work out into the world. And the great thing is that now there are so many great platforms to do this. For example, there are a couple directors based in LA pitched a web-series project called “Awesome Asian Bad Guys” on Kickstarter, and they got successfully funded. I’m inspired by them to pursue and take control of my own art through the grassroots movement. What are your ideal roles? The traditional Asian male stereotypes are versions of either the villain that lives for 20 seconds on screen, or the geeky, fresh-off-the-boat dude. And when I was younger, I avoided getting myself type-casted in these roles. But now I actually prefer and welcome these roles. Years ago, I had the chance of playing Othello from OTHELLO. Diving into the analysis of this classic villain made me realize that there is so much humanity in the villains. Most of the time, these characters necessarily aren’t innately evil, but the results of their struggle ends up maliciously affecting others. So, as an actor, it’s so much more gratifying and interesting finding the motivation and justification of the villain’s actions. As for the geeky characters, it’s just fun! My background is in clowning and the circus. So, finding the comic timing/rhythm of these characters is something I love. But nevertheless, I always try to find ways of humanizing these characters so they don’t end up being mere caricatures. And slightly subversively make choices that portray them as fuller, more truthful human beings. How do you think those of us Asians in the entertainment industry can help to eradicate the cliched perceptions of Asians such as we can only do martial arts movies, Asian women can only play maids or prostitutes, etc.? Well, I think there are two factors that play into this. Firstly, we need more Asian/Asian-American writers, producers and directors in the industry. There are many organizations and institutions that promote the growth of Asian/Asian-American creatives all across the nation. Secondly, as an actor, I think it’s really important to be self-generative in my work by writing and producing my own stories, then getting it out through the Internet. The Internet is kind of like the Wild West of our cultural landscape. Anything is possible. Also I think that community is very important. I support all of my Asian/Asian-American colleagues in the arts, business, and every sphere of society. If we can generate mutual support for the work we create even within the Asian/Asian-American community, it becomes sustainable. And this is how cultural transformation happens. For your legions of female fans, please let them know what you look for in a woman. Wit and intelligence. Also someone who’s serious about her work/passion projects, but doesn’t take herself too seriously. For aspiring young Asian actors who look up to you, what words of encouragement can you give them? Keep pursuing your dreams, no matter what people tell you. Only you can play you. And every single person is valuable. Also, yes, you need talent; yes, you need training; but the most important currency in this industry is persistence. And lastly, breathe and have fun. A Korean woman met a Japanese man on an airplane to L.A. They were Brian’s parents. Born in L.A. and raised in Japan, Korea, Hawaii, and Italy, Brian is an international actor based in Los Angeles, CA. Since debuting in THE DESCENDANTS, he has worked on and can be seen in HAWAII 5-0, BATTLESHIP, 47 RONIN, and several award-winning independent films. Brian is a New York-trained actor. He has has studied with world-renowned teachers, such as Misha Lobanov (Moscow Art Theater), Patsy Rodenburg, Min Tanaka, and Scott Rogers to name a few. His training ranges from Shakespeare to Method to Dance-Theater to Circus Arts. He is fluent in 5 languages – Japanese, Korean, English, Italian, and Portuguese – with a dash of other languages. He is also an experienced martial artist (4th degree black belt in Judo and Kendo). Brian is an avid Crossfitter, poet, and trapeze artist. 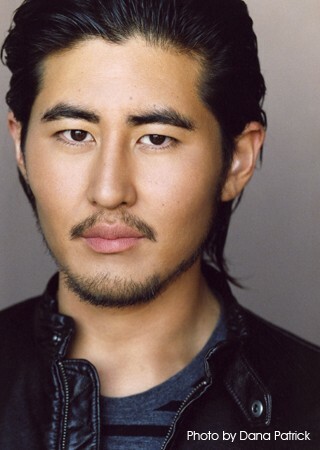 He is currently developing a web-series called “Secret Asian(t) Man” coming out in 2013.